TIGER TRAP: Stock Market Lost Decade BEGINS! The Federal Reserve has been telling us for close to a decade that they want inflation to steady at 2%, yet nearly all government-issued bonds have yielded less than that. For three years, they have been raising the FED Funds Rate, yet they haven’t changed their inflation target, which means that their strategy involves attracting investors to the yield these bonds now offer. For a 1-yr bond, the U.S. Treasury is willing to pay the lender a whopping 2.31%, so that after-tax, and adjusted for inflation, you have basically given Uncle Sam an interest-free loan. It seems that Treasuries are not risk-free yield, but yield-free risk. Loan the Treasury department your money for a full decade, and you will receive 3.06% annualized, which means that after-tax, you’ll be looking at a symbolic 0.4% every year. The FED keeps selling-off its bond portfolio, but the T-bills market continues to offer little value to investors. For close to a decade, then, this phenomenon called low-interest rates, has led most investors to buy stocks, simply because of their dividend yield, causing them to be priced for perfection. Focusing on the historical connection between stocks and bonds, we see that bonds, for the next decade, will actually perform better than stocks, using current valuations. 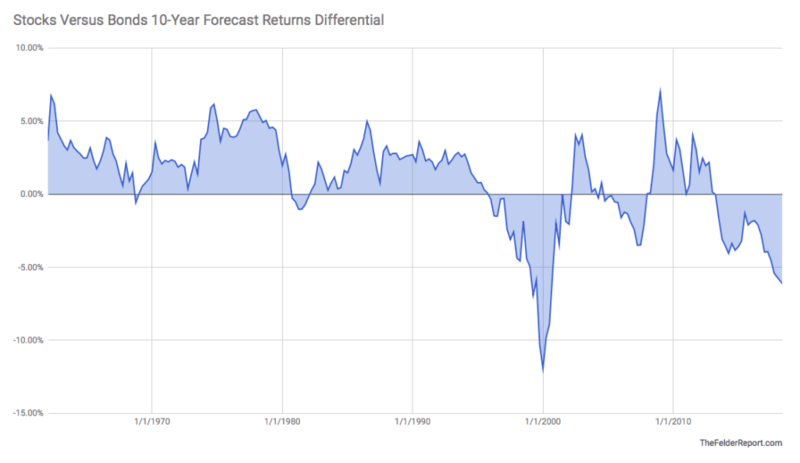 Jeremy Grantham, the billionaire hedge-fund legend, known mostly for his ability to make accurate 10-yr forecasts, has placed an annual decline of about 3% for stocks over the next ten years. In other words, the world’s best asset evaluator sees a sustained sideways bear market with the major indices, as the chart above confirms. Bonds, which yield a mediocre 3% in the next ten years, will be the favorable investment, as stocks will actually lose value, according to statistics. This is a major part of why I am positioning in commodities, even though I’ve been early by two years. It seems there is no end to the insistent selling. If you’ve ever been first to enter a nightclub, you know that being early is not fun at all. It has its perks, such as choosing where you want to sit or stand, ordering drinks without waiting in line, and using clean toilets. But you also know the DJ is playing the worst music, you see the club for what it is, while the staff is bored out of their minds, the adrenaline quickly leaves your body, and by the time the main event begins, you’re tired and ready to go, just as the fun begins. You’re envious of all the people who got the timing just right. In the stock market, being too early and being wrong, almost amounts to the same thing. 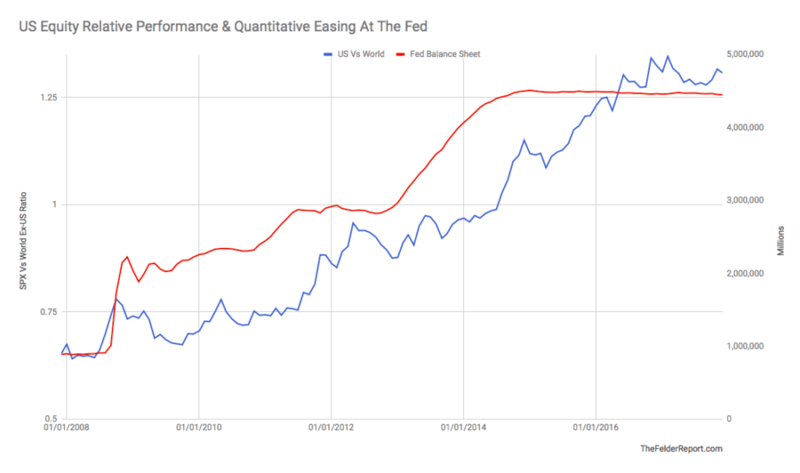 As you can see, Quantitative Easing has made sure that anyone, who thought they could time the end of the stocks bull market, would be punished. Therefore, I want to stress how important it is to truly build a strategy that is personalized for your lifestyle. The reason that I can, as an individual, build positions in the resource sector, for example, over the course of 2-3 years, while waiting for the sector to finally bottom and change paths, is because my businesses allow me to still make massive investments with the sectors that currently trend higher, simultaneously. In other words, for me, it’s not either or; it’s both. If I make the analogy again to the nightclub, it would be the same as reserving the best table in the house, but instead of just idly waiting for the party to start, you have a tailor-made, gourmet dinner served to your table, while you wait for others to arrive. You’re should not be sacrificing long-term dividend compounding for the sake of putting all of your available income into cyclical sectors, known to both bankrupt investors and make them tycoons. In 2017, we’ve made once-in-a-generation returns with cryptocurrencies. It seemed unbelievable, at times, to see our March 2017 alert on Ethereum at $12 continue to rise, week by week. In September of 2017, we were sitting on enormous gains. Then, Q4 of 2017 happened and defied all investment logic, sending Ethereum over $1,000. This is not a repeatable formula. It was the exception, not the rule. Remember, the key to allowing yourself breathing room with stocks is to increase income coming in from your primary career, so that your speculative portfolio doesn’t overshadow long-term wealth building. CHECKMATE: Record Short Squeeze – CAPITALIZE NOW! Watch these three companies closely – the short squeeze might be immediate.